Equitrac Corporation is the global leader of intelligent print management and cost recovery software solutions for the corporate, legal, education, healthcare and financial services markets. Equitrac's solutions are mission critical to all enterprises that are looking to more effectively manage their printing environments, reduce printing costs, increase security and lessen their environmental impact. The company is backed by an unmatched R&D program and is a preferred technology partner with all leading providers of multifunction devices. 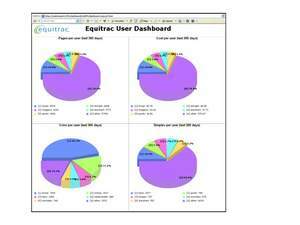 Equitrac is has been in business for 30 years and has more than 23,000 customers in 40 countries. Equitrac's solutions are deployed in Global 500 companies, AMLAW 200 legal firms, and leading colleges, universities and school districts. For more information, visit www.equitrac.com.